The Falcon 9 launch of GovSat-1 in January. SpaceX is now certified to use that rocket for NASA science missions, starting with an astronomy satellite scheduled for launch no earlier than mid-April. NASA disclosed the certification in its full fiscal year 2019 budget proposal, released Feb. 14, in a section about NASA's Launch Services Program (LSP). "In January 2018, SpaceX successfully completed ‘Category 2’ certification of the SpaceX Falcon 9 ‘Full Thrust’ with LSP which supports the launch of the NASA Transiting Exoplanet Survey Satellite (TESS) mission in March 2018," it stated. Category 2 certification covers "medium risk" missions, and requires between one and three consecutive successful missions, depending on the vehicle’s heritage and level of NASA insight. That certification was required to clear the way for the launch of TESS. Rep. Mo Brooks (R-Ala.) also raised questions about the vehicle's certification, citing a June 2015 launch failure on a space station cargo mission and September 2016 pad explosion. "Do you have any concerns that the Block 4 version of the SpaceX Falcon 9 rocket will not be certified in time for TESS to launch in March of 2018?" he asked Thomas Zurbuchen, NASA associate administrator for science and one of the witnesses at the hearing. "At this moment in time I don't have any such concerns," Zurbuchen responded, noting that final certification was scheduled at that time for early 2018. 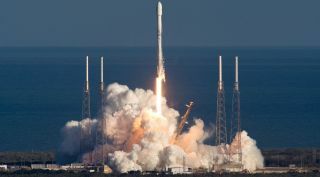 NASA Goddard Space Flight Center spokesperson Claire Saravia said Feb. 15 that the launch was postponed at the request of SpaceX, who sought "additional time for hardware readiness and to meet NASA launch service mission requirements." The spacecraft itself, she added, was in "excellent condition" at the Kennedy Space Center, where it undergo payload processing for the launch. Besides certifying the Falcon 9, the Launch Services Program has been supporting "preliminary activities" for certifying the current version of the Orbital ATK Antares launch vehicle, according to the budget documents. The program has also started certification discussions regarding vehicles still in development, including Blue Origin's New Glenn, Orbital ATK's Next General Launch and United Launch Alliance's Vulcan.